"My name is Safia Dirie. My family has always been my mum, Hoyo, and my two older brothers, Ahmed and Abdullahi. I don't really remember Somalia - I'm an East London girl, through and through. But now Abo, my father, is coming from Somalia to live with us, after 12 long years. How am I going to cope?" Safia knows that there will be changes ahead but nothing has prepared her for the reality of dealing with Abo's cultural expectations, her favourite brother Ahmed's wild ways, and the temptation of her cousin Firdous’s party-girl lifestyle. Safia must come to terms with who she is – as a Muslim, as a teenager, as a poet, as a friend, but most of as a daughter to a father she has never known. Safia must find her own place in the world, so both father and daughter can start to build the relationship they both long for. From Somalia With Love is one girl's quest to discover who she is – a story that, while rooted in Somali and Muslim life, strikes a chord with young people everywhere. Awhile back, I read a few reviews of From Somalia, With Love and thought 'that sounds like a book I'd like to read' and promptly forgot about it. So I was absolutely thrilled earlier this year when Frances Lincoln offered to send me copies of both this and Na'ima B. Robert's latest book Boy vs Girl. From Somalia, With Love is a really gentle and lovely story of a girl who's trying to find her place in the world. Safia left Somalia when she was very young and remembers little about it. Home is in London with her mother and her two older brothers. She still struggles with fitting in, wearing hijab and writing poetry, finding that balance between Somalian and Islamic cultures and finding the right place living in England. And everything is made more of a struggle, when her father, Abo comes to live with them after 12 years apart in Somalia. Safia admits herself, that in some ways she feels a lot older than 14 with the amount of responsibility she has at home and in other ways she feels a lot younger than other girls her age because of her lack of experience. I loved the innocence of Safia as she deals with all the changes in her life. Her mom, Hoyo, directs all of her attention on Safia's dad. Her brothers are always arguing. Her favourite brother Ahmed doesn't see eye-to-eye with Abo. Safia begins a relationship with a cousin who has given up the hijab and has been passed between family members with the vague rumours of bad behaviour. Where does Safia fit in? And how are the broken pieces of her family going to come together again? 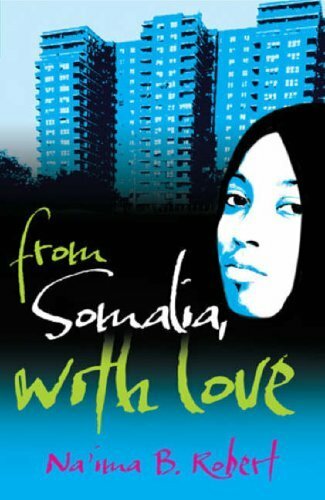 What I loved most about From Somalia, With Love is how much I was able to relate to Safia's character. She isn't sure of her position in the family after Abo's return and with that uncertainty, she begins to make decisions that are possibly not the best choices for her. I completely and utterly relate to this lack of stability causing a change in normal behaviour. Safia is really torn between this conflict with her parents and Ahmed and things just aren't right in her world until everyone is home and safe. The most fascinating aspect of this book is this glimpse into what it's like to be a Somalian British Muslim teenager living in London. I think it's absolutely wonderful that Na'ima B. Robert is able to give a voice to a large minority group. There's a particular scene that really moved me. Safia is at a bus station, waiting for her cousin and she walks past a group of Asian teenage girls wearing hijab when a group of teenage boys come along and start harassing them for what they're wearing. One girl stands up to them only for the boy to spit in her face, and a woman witnessing this scene mutters something along the lines of 'that girl deserves it wearing that.' But mixed in with everything are all these great details of what it's like to be a Muslim girl, with the praying and the customs and Arabic greetings. It paints a very vivid picture. The book is quite slim, and it's really only Safia that we come to see developing in any way apart from a more detailed description of Abo towards the end of the book. I would have liked to have heard more of the experiences of Safia's brothers or mother. But all in all, a wonderful little book. A gentle story of growing up and fitting in and of family. I've been wondering what this one is like, so it's great to read this review. Safia sounds like a really interesting character, and I like the sound of the story. Lauren - I remembered reviews of it ages ago, but haven't seen anything recent about it. She is quite an interesting character and I really enjoyed reading a story that I hadn't heard before.